At Drummond Corporation we specialize in the fabrication of all precision machined plastics - to your exact specifications. We have a wide variety of CNC machining equipment for your complex machining needs. We also have conventional plastic machining equipment for the production of high quality plastic components at competitive prices. 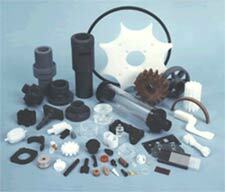 In that we produce only machined plastics and non-metallic components, our parts are always clean and contaminant free. We also offer plastic polishing, molded part alterations, and engineering services for your plastic fabrication needs. for your machined plastic part needs.